A hotshoe (sometimes written “hot shoe”) is a metal bracket on top of your camera with electrical contacts where an external device (such as a speedlight) can be connected. 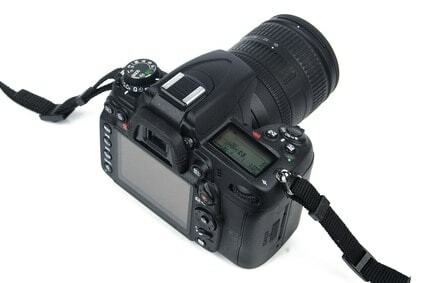 Most DSLRs come equipped with a hotshoe while compact cameras do not. The foot of an external flash unit slides into the bracket of the hotshoe. There is a wheel on the speedlight to securely lock it into place on the camera. Once attached, the speedlight prevents the pop-up flash from activating. The flash unit creates a circuit between the shoe and the contacts. Once the circuit is complete, the flash will fire as the shutter is pressed down. The benefit of attaching a speedlight to the hotshoe is that it gives the photographer a more powerful external flash unit. Most speedlights or external flashes can throw more light at a further distance than your camera's pop-up flash: the on-camera flash can throw light on a subject at a maximum of 10-12 feet while an external flash can reach approximately 150 feet. The hotshoe, which looks like a squared-off “U”, has a metal contact point in the center. (Many cameras also have proprietary designs with additional metal contacts.) The camera and flash unit must have matching contacts through which they exchange information about when and how long to fire as well as information about the distance between the subject and the speedlight. That electrical exchange of knowledge is how the term “hotshoe” was born. Earlier cameras (pre-1970s) also had a similar U-shaped bracket called a “cold shoe” or “accessory shoe”, but without the electronic contacts. Instead, the flash was connected to the camera using a wire running from the flash to a socket on the camera. When electrical contacts were added to the “cold shoe” it became “hot” – now known as the hotshoe. The circuitry of the hotshoe is manufacturer specific, meaning that you will need to buy a speedlight made specifically for your camera brand for full functionality. You can use a Nikon speedlight on a Canon, but you will lose some of the features and will need to purchase a remote trigger. There are also third-party flashes on the market that are made for your camera as a less expensive option. You can also take your speedlight off the camera to set up creative lighting situations. There are wireless transmitters that can slide onto the hotshoe that will trigger the flash. Some wireless transmitters transmit a single command just to fire the flash while others allow for more complicated commands just like if the flash was directly attached via the hotshoe. But external flashes are not the only device that can connect to a hotshoe. Other accessories include a geotagger/GPS receiver, a spirit level, a shotgun stereo microphone or a radio transmitter to fire a remote flash. There are even reflectors or diffusers that can connect to the hotshoe! And let’s not overlook a Wi-Fi option – there are devices that can slide into the hotshoe and, with a corresponding app, allow you to view your images remotely on your tablet or smartphone. Some apps even allow you to control some camera functions including aperture, shutter, ISO and white balance. Hotshoe adapters can even trigger studio lights!